There are hundreds of high-end, luxary, and botique hotels in New York City that offer some form of free Wi-Fi Internet access to the their guests. Get online for no charge with free wifi at these New York City hotels. Some hotels in NYC offer free WiFi in common areas such as the lobby, pool area, restaurant, bar and meeting rooms. The use in these areas is commonly restricted to guests but sometimes they may make the wireless access available to non-guests as well. Below is a list of popular hotels in New York City that are currently offering free Wi-Fi. Do you know more NYC hotels with free wireless? 60 Thompson (60 Thompson St, New York, NY) - Given its stylish address and popularity with the hip, moneyed set, this fashionable boutique hotel could have wound up with a staff too busy awaiting their big breaks as models and actors to devote themselves to their jobs. On the contrary, 60 Thompson shines thanks to its competent, welcoming employees, as well as the phenomenal design job by Thomas O’Brien and Aero Studios. Complimentary high-speed Internet access in guest rooms and the business center. 70 Park Avenue Hotel (70 Park Ave, New York, NY) - Forget the velvet ropes. When the California-based Kimpton hotel chain bought the dowdy Doral Park Avenue in Murray Hill in 2003, it vowed to create a boutique hotel that felt both exclusive and welcoming. Guests can visit the lobby nightly for complimentary wine receptions, or hit the town knowing that Fluffy will be taken care of by the hotel’s pet-friendly staff. Abingdon Guest House (13 8th Ave, New York, NY) - Abingdon Guest House, named for the nearby park, Abingdon Square, offers guests a warm and inviting residential ambience with all the modern conveniences. Abingdon Guest House consists of two landmarked 1850's Federal style townhouses located in Greenwich Village, one of Manhattan's most charming and historic neighborhoods, for decades the center of New York's artistic and intellectual life. Algonquin Hotel (59 W 44th St, New York, NY) - The historic Algonquin Hotel is located in the heart of Midtown Manhattan. Since opening in 1902, it has set the standard in luxurious New York accommodations for business travelers, tourists and some of New York's most exceptional talents. While the hotel continues to draw literary types, the biggest draw is the Oak Room, a cabaret club notable for launching the careers of Michael Feinstein and Harry Connick Jr.
Clarion Hotel La Guardia Airport (9400 Ditmars Blvd., New York, NY) - New York Clarion provides superior value and exceptional comfort. Kick back in our newly renovated rooms with 24-hour food delivery. We’re comfortably located in a quiet, residential neighborhood for a great night’s rest. Get going in the morning with free breakfast, free Wi-Fi, free fitness center, and handy business center. Comfort Inn (442 W. 36th Street, New York, NY) - Located just two blocks from the Jacob K. Javits Convention Center, the Comfort Inn Convention Center is an ideal place for both business and leisure travelers. This New York City, NY hotel is less than two miles from the Empire State Building, the Statue of Liberty, Times Square, Madison Square Garden arena and the Broadway Theater district. Free wireless high-speed Internet access in all rooms. Comfort Inn (129 West 46th St, New York, NY) - The Comfort Inn Midtown is a 100 percent smoke-free hotel conveniently located in the heart of the Times Square. This New York City, NY hotel is within walking distance from Rockefeller Center, world-class shopping on Fifth Avenue, Grand Central Terminal, the famous Museum of Modern Art, and many of New York City's finest restaurants and attractions. Free wireless high-speed Internet access in all guest rooms & public areas. 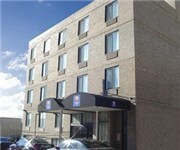 Comfort Inn (133-43 37th Avenue, New York, NY) - The Comfort Inn Flushing serves complimentary continental breakfasts. Complimentary coffee is available in the lobby. The front desk is open 24 hours a day. The hotel includes a business center and offers complimentary high speed Internet access. Comfort Inn Manhattan (42 W. 35th St., New York, NY) - The Comfort Inn Manhattan (N.Y.) offers convenient accommodations just one block from the Empire State Building and Macy's department store. Guests of the Comfort Inn are within walking distance of Grand Central Station and Broadway. 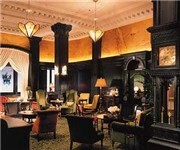 The 12 story hotel boasts a newly renovated lobby which still maintains the charm of its pre war construction. Wireless Internet access is available throughout the hotel. Courtyard Marriott New York Manhattan/Upper East Side (410 E 92nd St, New York, NY) - The Courtyard Marriott Upper East Side Manhattan Hotel is located in the Upper East Side, a vibrant NYC residential neighborhood. Each hotel room reflects the charm of the Upper East Side & features the Marriott bed, free hi-speed Internet & large work desk. Courtyard Marriott New York Manhattan/Fifth Avenue (3 E 40th St, New York, NY) - Experience our unique, 30-story, boutique hotel located near New York City's exciting Fashion District. Our hotel is within walking distance of the New York Public Library, Bryant Park, Times Square, Rockefeller Center, Broadway's Theatre District, Grand Central Station and the Empire State Building. Besides a great location, guests will enjoy comfortable rooms with a desk and complimentary high-speed internet access. 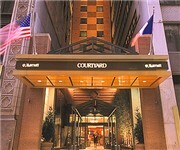 Courtyard Marriott New York Manhattan/Midtown East (866 3rd Ave, New York, NY) - The Courtyard by Marriott New York Manhattan Midtown East is the perfect hotel choice for business & leisure travel to New York City. Come experience our first class service and spacious hotel accommodations in the heart of Midtown. Guests of our Midtown NYC hotel stay connected with free hi-speed Internet in all hotel rooms and the option to enjoy Wi-Fi in our upper lobby. Courtyard Marriott New York Manhattan/Times Square South (114 W 40th St, New York, NY) - The 32-story hotel offers 244 newly renovated rooms and suites, meeting rooms, dining facilities, and a fitness center. We provide a full range of the features and services you value most to let you get down to business. Crowne Plaza Hotel (104-04 Ditmars Blvd, New York, NY) - Times Square, always New York’s most exciting scene, seems all new now that the Crowne Plaza Times Square has reinvented itself. Herald Square Hotel (19 W 31st St, New York, NY) - The Herald Square Hotel brings you the best value buy in New York City with FREE Wi-Fi, FREE HBO's, upgraded rooms and Lobby, 4 Star beds throughout the hotel for the best night's sleep in NYC. Hotel Chelsea (222 W 23rd St, New York, NY) - The Hotel Chelsea is a world renowned residence for artists, musicians, writers, philosophers, and characters of the most singular and eccentric stripes which the imagination might conjure. Complimentary Wi-Fi is now available in all guest rooms at the Chelsea Hotel. Hilton New York (1335 Avenue of the Americas, New York, NY) - See New York from a fresh new perspective at the exceptional Hilton New York hotel. Find a quiet respite from the city that never sleeps in Hilton's spacious and modern guest rooms and suites. Free high-speed Internet access in the hotel lobby and designated public areas. Holiday Inn Midtown-57th Street (440 W 57th St, New York, NY) - Nestled in a quiet residential neighborhood, The Holiday Inn Midtown 57th Street is conveniently located to famous New York attractions. Just three blocks from Central Park and Carnegie Hall with Lincoln Center nearby. Free wifi in the lobby and all guest rooms. Hotel Elysee (60 E 54th St, New York, NY) - Wireless High Speed Internet access throughout the hotel, with a computer for guest use in the Library of the Club Room. This romantic gem of a hotel in the heart of Midtown might be easy to miss: It's dwarfed by modern glass towers on either side of it. But that it is so inconspicuous is part of the Elysée's immense romantic appeal. Hotel Gansevoort (18 9th Ave, New York, NY) - Hotel Gansevoort, with breathtaking 360 degree panoramic views of New York City and sunsets over the Hudson River, is the first and only luxury, full service resort in Manhattan’s vibrant Meatpacking District. 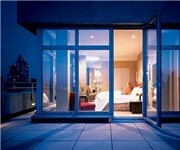 Hotel Gansevoort offers a chic retreat from the urban metropolis that redefines the world of luxury accommodations. Sophisticated and minimalist, guestrooms feature a color palette of neutrals and grays with a shot of blackberry. Free wireless internet throughout the hotel and guestrooms. 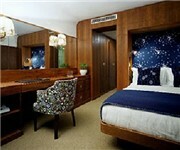 Hotel Giraffe (365 Park Ave, New York, NY) - Hotel Giraffe is a luxury boutique hotel in New York. It is located on Park Avenue, south of midtown and north of downtown. Of all the boutique hotels in New York City, Hotel Giraffe embodies the gentle power, grace and beauty found in one of nature’s most beloved animals. This luxury boutique hotel in New York offers timeless style, spacious guestrooms and suites, and most importantly, gracious service that makes it an ideal New York City getaway for leisure and business travelers alike. Free wifi in the lobby and all guest rooms. Hotel on Rivington (107 Rivington Street, New York, NY) - Hotel on Rivington is a luxury boutique hotel on New York City's Lower East Side and features Thor restaurant, designed by Marcel Wanders. Hotel Metro (45 W 35th St, New York, NY) - The Hotel Metro offers the finest New York City hotel accommodations with deluxe guestrooms and an array of modern amenities such as free wifi delivered with casual but impeccable service. Enjoy complimentary continental breakfast each morning in the hotel's warmly appointed lounge or an afternoon snack in the Metro Grill restaurant. Grace Hotel (125 W 45th St, New York, NY) - Housed in a narrow, converted office building on a gritty side street off Times Square, Hotel Grace (Hotel QT) offers an unceremonious arrival. A smattering of frills like flat-screen TVs, WiFi internet, Egyptian cotton linens, and binders stocked with delivery menus make up for the skimped amenities. Hudson Hotel (356 W 58th St, New York, NY) - Hudson is a modern New York City hotel, conveniently located close to Central Park and the theater district. See the Hudson's stunning interiors, designed by Philippe Starck. Located in Columbus Circle and steps from Central Park, the hotel features Hudson Bar, Hudson Cafeteria, Private Park and the rooftop lounge, Sky Terrace. Free wifi is in the lobby and all guest rooms. Library Hotel (299 Madison Ave, New York, NY) - The Library Hotel New York City is Manhattan's most celebrated concept luxury hotel. Fashioned from a landmark 1900 brick and terra cotta structure, this boutique treasure has been beautifully restored into a small luxury New York City hotel of the highest caliber. An oasis of modern elegance, the Library Hotel in New York and its attentive staff provide a thought provoking experience to sophisticated Midtown Manhattan travelers with a passion for culture and individual expression. High speed Wireless Internet throughout the hotel. Millenium Hilton (55 Church Street, New York, NY) - New York City's Millenium Hilton hotel rooms and suites are well appointed with high-tech amenities including a 42" plasma screen television, high-speed Internet access, dual-line cordless phone with data port and personalized voicemail, and the Hilton Clock Radio which provides a mini-plug for your MP3 Player. Morgans Business Conference Hotel (237 Madison Ave, New York, NY) - Morgans Hotel is a luxury boutique hotel in New York and part of Morgans Hotel Group. Located on Madison Avenue, the hotel features Asia de Cuba restaurant from famed restaurateur, Jeffrey Chodorow. New York Marriott East Side (525 Lexington Ave, New York, NY) - When visiting New York City, there's no better place to stay than the New York Marriott East Side hotel. Having recently completed a $24 million guest room renovation, this hotel in Midtown Manhattan, NY is a treasure. Free high-speed Internet access in public areas only, guest room wifi is NOT free. New York Marriott Marquis Times Square (1535 Broadway, New York, NY) - The New York Marriott Marquis brings the energy of Manhattan to your door. Located in the heart of Times Square and the Broadway theater district, this Midtown Manhattan hotel is perfect for weekend getaways, family and business travel. Free high-speed Internet access in public areas only, guest room wifi is NOT free. Omni Berkshire Place Hotel (21 E 52nd St, New York, NY) - The Omni Berkshire Place is a refined, yet comfortable New York City hotel in Midtown Manhattan that has become a haven for discerning travelers. The hotel's location on Madison Avenue near Central Park and Broadway make it an excellent destination for vacationer, while its services an amenities appeal to those looking for a great business hotel in New York. If you'd like to experience luxury Midtown Manhattan Accommodations that surround you with classic luxury and contemporary design the Omni Berkshire Place hotel is the place to be. Whether you are traveling to New York for business or pleasure, the Omni Berkshire Place makes sure that you can stay connected with high-speed Internet access in our hotel lobby and designated public areas. On The Ave (2178 Broadway, New York, NY) - Let the relaxed-yet-stylish attitude of ON THE AVE HOTEL set a unique tone for your next NYC experience. Crisp, contemporary, and modern, with an edgy loft-inspired design, this New York City boutique hotel expertly blends casual style with the fashionable allure of Manhattan. Portland Square Hotel (132 W 47th St, New York, NY) - The Portland Square Hotel, a New York City Times Square hotel provides clean, comfortable accommodations and friendly service – at an unbeatable price and location! Stay in the heart of Manhattan … only minutes from world-renowned shopping and attractions. Find the deal of your dreams in one of the stores and emporiums of Fifth Avenue. Complimentary wireless high-speed Internet, in all guest rooms. Quality Hotel Times Square (157 W. 47th St., New York, NY) - Nestled in the heart of the Broadway Theater District in the city that never sleeps, the Quality Hotel Times Square is the premier destination for visitors who want to enjoy the lights on Broadway, Fifth Avenue shopping and the famed 42nd Street. Ramada Inn East Side (161 Lexington Ave, New York, NY) - The hotel offers a variety of thoughtful amenities and services including free Wireless Internet, complimentary continental breakfast, 32 in LG flat panel HDTVs, USA Today and NY Post Newspapers, personal safes, laundry and valet services, as well as reduced-rate parking. Red Roof Inn (6 W 32nd St, New York, NY) - The recently renovated Red Roof Inn Manhattan is located on 32nd Street between Broadway and Fifth Avenue, just steps away from the Empire State Building, Macy's, the fashion district, Penn Station and Madison Square Garden. The hotel offers a variety of thoughtful amenities and services including free Wireless Internet, complimentary continental breakfast, flat screen TVs, and free calls within the US. Residence Inn New York Manhattan/Times Square (1033 Avenue of the Americas, New York, NY) - Times Square, Central Park, Rockefeller Center are all landmarks which are synonymous with New York City. These and others like Empire State Building, Broadway theaters and Bryant Park to name a few are a short walk from the new Residence Inn by Marriott/Times Square. Complimentary wired and wireless High Speed Internet in guestrooms and wireless in public areas. Royalton Hotel (44 W 44th St, New York, NY) - Leisure and business travelers alike will benefit from the Midtown location of the Royalton New York Hotel, conveniently placed within walking distances from the Business, Garment and Theater Districts as well as Times Square and Bryant Park. Guests have access to a wide range of amenities and services, including the trademark “Brasserie 44” restaurant, wireless internet, HD flat screen televisions and excellent design. Sheraton New York Hotel & Towers (811 Seventh Avenue at 52nd St., New York, NY) - Located between Central Park and Times Square in the center of Manhattan's Midtown business and entertainment district. Move from your perfectly choreographed business event to preferred seating at a famous uptown eatery without missing a beat. Super 8 Hotel Times Square (59 W 46th St, New York, NY) - The Hotel at Times Square, a newly renovated boutique hotel, is located on 46th Street between Fifth and Sixth Avenues, near Rockefeller Center, Times Square, the theater district, the Museum of Modern Art, Grand Central Station, and Fifth Avenue shopping. The hotel offers a variety of thoughtful amenities and services including free Wireless Internet, complimentary continental breakfast, and flat-screen TVs. The Blakely New York Hotel (136 W 55th St, New York, NY) - In contrast to recent trends of modern boutique hotels, where comfort takes a back seat to style, The Blakely New York has been created in a traditional design with the emphasis on service and comfort. Complimentary wireless, high-speed Internet access. The Maritime Hotel (363 E 16th St, New York, NY) - This glamorous Chelsea hotel, once the headquarters for the National Maritime Union, made its striking debut in June 2003. The owners revamped the building, using its nautical architectural elements—most notably the 5-foot porthole windows (one per room) overlooking the Hudson—and expanding on them with perfectly conceived details, such as the cabin-like teak furniture. The rooms have custom beds with Japanese fabric headboards, 20” flat-screen TVs, a complimentary WiFi connection and dimmer lights, as well as a waterfall showerhead in the green-tiled bathroom. The Milburn Hotel (242 W 76th St, New York, NY) - "When you stay with us, you'll feel like you're in a home away from home. All the comforts you'd expect – a classical lobby with fireplace library/lounge and soft couches, and spacious apartment-like settings with well equipped kitchenettes. Our luxuriously firm beds, modern tiled baths and upscale amenities will pamper and delight you. And some extras – a computer room, and an exercise facility." The Peninsula New York (700 5th Ave, New York, NY) - Housed in a beauty of a landmark Beaux Arts building, the Peninsula is the perfect combination of old-world charm and modern, state-of-the-art technology. Free wifi most public areas and all guestrooms. Washington Square Hotel (103 Waverly Pl, New York, NY) - The Washington Square Hotel has provided a haven for writers, artists and visitors to Greenwich Village for more than a century. Today, savvy travelers enjoy stylish accommodations, warm service, fine dining and easy access to the best of lower Manhattan. Evoking Paris of the 1930s, the lobby features an intimate bar where guests can take advantage of complimentary wireless internet access while enjoying afternoon tea, cocktails and light fare. The renovated deluxe guest rooms feature Art-Deco styled furnishings, pillow-top mattresses, terry cloth robes and complimentary high-speed internet access. NYCwireless - a non-profit organization that advocates for and enables the growth of free, public wirelessnetworks in and around New York City. Openwifinyc.com - free wifi hotspots in New York - directory of free Wifi hotspots in NYC. Budget hotels with free WiFi in NYC - comprehensive directory of discount hotels with free wifi in NYC.